The ground floor footprint and storey height is dictated by the requirements of the manufacturing process. The architect has avoiding producing a slab sided box by adopting a plan shape with the north and south elevations tapering to the curved eastern elevation, whilst the western end provides the access to the three manufacturing bays. In order to reduce the mass of the building each of the upper floor plates at first, second and third levels is of a different size and shape to the one below providing large external terraces at each level. 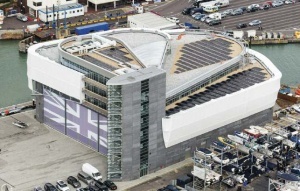 A fabric façade resembling sails wraps around part of the elevations which, as well as providing architectural interest, serves the practical purpose of providing solar shading and a wind barrier, enabling natural ventilation even on days with high wind speeds. 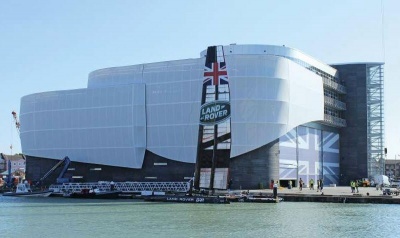 The programme to deliver the building was extremely short with a lead-in time of only around 3.5 months from architects’ pre-planning concept stage to commencing construction. Hence, it was essential that as much of the building structure as possible should be manufactured offsite and delivered on an ‘as required’ basis. Structural Engineer Reuby & Stagg Ltd.
Steelwork Contractor T A Colbourne Ltd.
Main Contractor Allied Developments Ltd.